How to block auto-replies on Exchange for external users? 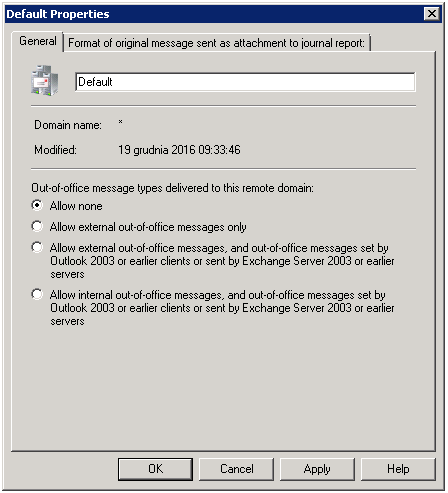 How to block sending out-of-office messages on Exchange Server for external recipients? Sometimes you may need to prevent auto-reply messages from being sent to people outside of your organization. No matter what the reason is for such a setting, you can quickly block out-of-office messages (OOF) directly on the Exchange Server. This way you can ensure that all users in your organization have the out-of-office messages blocked for external recipients. 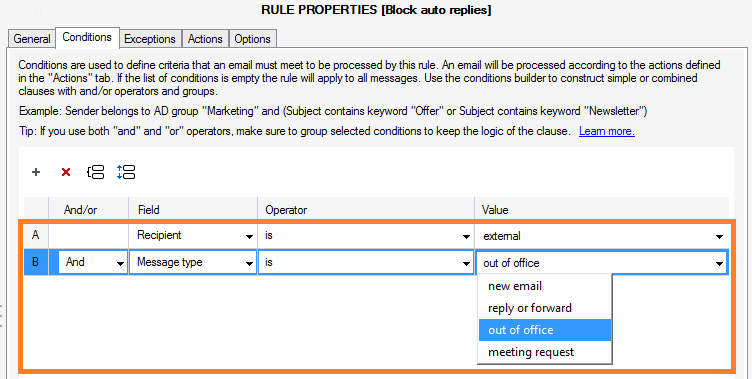 This article explains how to set up a mail flow rules to stop auto-replies from being sent outside Exchange 2016 and 2013, 2010 and 2007 organizations. Log in to the Exchange Admin Center (EAC) at https://localhost/ecp/. In the EAC, go to mail flow>rules. Click on the Plus icon and select Create a new rule. a. Apply this rule if…> The recipient… > is external/internal. b. Then, in the next dialog box, select Outside the organization and click OK.
a. 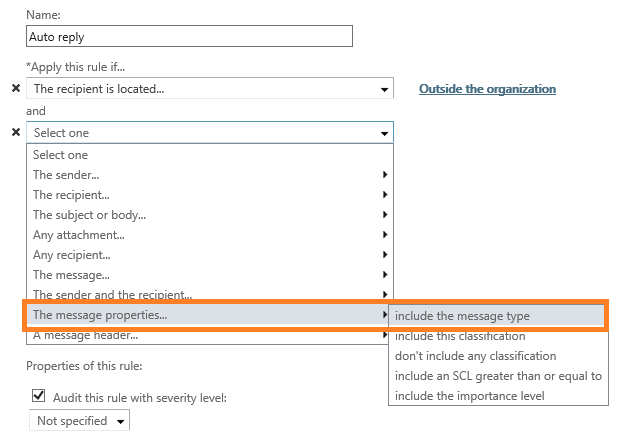 The message properties…> include the message type. b. 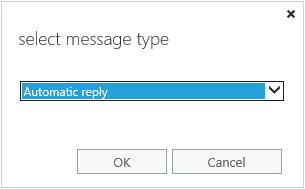 In the resulting dialog box, set the message type to Automatic reply and click OK. In the Do the following… section, select: Block the message…> delete the message without notifying anyone. Click Save to implement changes. Now, all automatic replies sent outside your organization should be blocked and deleted automatically. 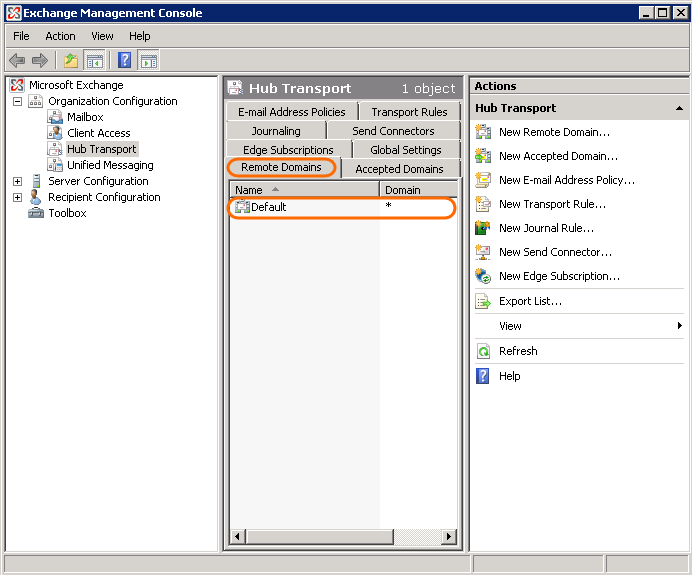 Expand Organization Configuration, and click on Hub Transport. In the central part of the window, select the Remote Domain tab. Then, right click on Default and select Properties. In the resulting dialog box, under the General tab, select the Allow none option to block all auto-replies both to external and internal recipients. Or select the Allow internal out-of-office messages, and out-of-office messages set by Outlook 2003 or earlier or sent by Exchange Server or earlier server option to allow only auto-replies configured as internal. 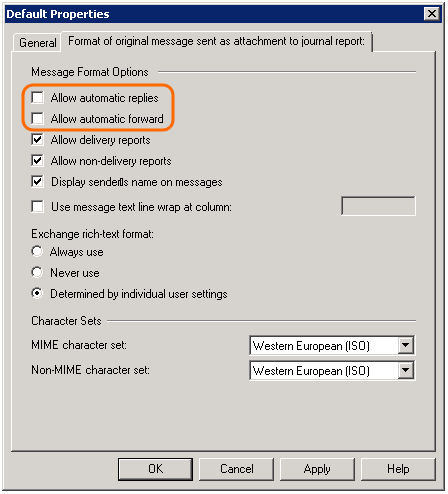 In the Format of original message sent as attachment to journal report tab (or the Message Format tab in Exchange 2010), leave Allow automatic replies and Allow automatic forwards options unchecked to block all automatic replies and automatic forwards (not only OOF). The command sets up John Doe’s mailbox to do not send out-of-office messages to external users. If you are a user of CodeTwo Exchange Rules Pro, a powerful server-based application for email signatures and email flow management purposes, you can use it to block external out-of-office messages with just a few clicks. Open the Administration Panel of the program. 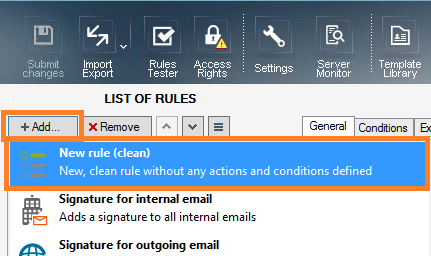 Add a new rule – click the Add button and then select the New rule (clean) option. In the General tab, name the rule and, in the Enable/disable rule section, check the Enable rule box to activate it (this will not immediately push the rule to the production – you need to hit the Submit changes button first to run the newly enabled rule). Do not make changes in the Exception tab. In the Actions tab, click on the Add button and select the Block message option. In the Options tab, you can make some final changes according to your needs. Save the settings by clicking Submit changes. That’s it! Now the program will block every auto-reply message before it hits external recipients. As CodeTwo Exchange Rules Pro is a server-based application, the rule is applied to all messages that meet the conditions, no matter what email client or device (including mobiles) a message is sent from.